Tenshinhan "Ten, Tien, Tien Shinhan"
Tenshinhan is a fictional character from the Dragon Ball manga series created by Akira Toriyama. Trained by the Turtle Hermit's rival, the Crane Hermit, he starts out as an enemy of Son Goku but soon makes peace and becomes an ally. He is usually accompanied by Chiaotzu, his training partner and best friend, whom he can communicate with telepathically. 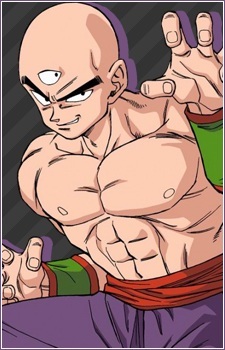 Tenshinhan has a unique physical composition, he has the ability to grow arms from his back, split into four people, and he has a third eye on his forehead. During the early years of his life, Tenshinhan entered the ruthless Crane-Style School where he learned powerful ki-based techniques such as the Dodonpa, the Kikoho and the Taiyo-Ken, he was taught deadly assassination techniques by the Crane Hermit's younger brother, Tao Pai Pai. At the time of his introduction, Tenshinhan is among the most powerful warriors in the series, matched only by Goku himself. Heavily devoted to martial arts, reclusive and disciplined, Tenshinhan is one of the strongest humans within the Dragon Ball world. He battles alongside the other characters when major threats to the Earth surface, often courageously engaging enemies far more powerful than himself. As is the case with a handful of other characters from the early chapters of Dragon Ball, Tenshinhan was inspired by a character from Journey to the West; his unique feature of having a third eye was derived from the Chinese god Erlang Shen. According to the Daizenshuu book 7 and the PlayStation 2 game Dragon Ball Z: Budokai Tenkaichi, Tenshinhan is a descendant of the alien race of the "Three-Eyed clan."